Performance Time: Approximately 45 minutes, 38 pgs. COLLECTION. This collection of three short plays provides a humorous behind-the-scenes look at theatre. 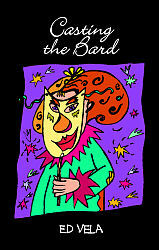 In “Casting the Bard,” three exhausted drama teachers find themselves stuck in a precarious position—they have to cast for the role of Puck in “A Midsummer Night’s Dream” but they only have three students to choose from. The students vying for the role all have major negatives, but trying to decide which student is the best of the worst is the hardest job of all. In “Just a Few Brief Notes…” the director of a school production of “Tom Sawyer” struggles to direct a surfer cast as Huck; an uptight shoe-wearing Tom Sawyer; and a Becky Thatcher who thinks she’s tongue-zilla. And in “The Art of Compromise,” a playwright attempts to compromise with an avant-garde director who wants to transform his modern courtroom drama into the story of a Viking mother brainwashed by a Russian hypnotist.